This past weekend, I was feeling in a very unproductive mood. I didn’t want to do work, I wanted to do weekend stuff, like sit on my bum and play World of Warcraft all afternoon and evening. The only problem was, I didn’t know what I wanted to play. I didn’t feel like working on achievements or grinding on my hunter. Ferguson hasn’t healed since the patch, and I am sure I’m out of practise. I don’t want to group for anything anyway, I just want to play on my own for a while. My mage was sitting at level 55 waiting for someone to take her through Sunken Temple before all the quests turn grey. Yup, I was in a ‘start a new character’ mood again. I’m enjoying the achievement system, but I bet it’s a whole different experience when going through from level 1. All the statistics would be accurate, you’d start off with 0 points instead of 1000. I want to experience that. So, I head to the character creation screen. I’ve run out of room on Hydraxis, so I head to Dark Iron – my Alliance server, home to my little mage. Gnome? Got one of those. Dwarf? Dwarves are cool – but female dwarves are ugly! My options are: Priest (got one), Hunter (got one), Warrior (started an alt warrior recently, got bored at level 13), Rogue (same as warrior) and Paladin (I hate paladins almost as much as Night Elves). Well, I have to pick something. Something fun to play, that I’m likely to get over that level 13 hump with. I know that I like priests and hunters…. But I hated leveling as a priest. And right after I finished picking out his grey hair and pale skin and started logging in, I knew I’d made the right choice. It’s been so long since I leveled as a hunter, but it was so enjoyable to me. And now that I know so much more about the class, it will be great to try to do it all over again, play without Steady Shot or a warrior tank to level from 1-60 with. It will also be neat to see how the pet changes work at lower levels. As I venture through, I’ll likely post little pointers or things I’ve noticed going back through the class. It’s going to be a fun ride, I think! Right now, i’ve gotten him to… 13. That’s the level the majority of my alts stay at, but I am determined to make some more progress with this little guy. Yes, Gnome Mage, to be precise! I started this character shortly after the Burning Crusade. I have a horrible memory, and I’m not sure why I wasn’t leveling my hunter at this time, but I spent the first couple months of BC leveling an alt, and it wasn’t even one of the new races. Her name was Pixxel, and she had firey red pigtails and burning red eyes. Fire burned deep down in her tiny soul. Pyroblasts and Fireballs were all she needed to have a good day. My hunter was the only other character I’d gotten past about level 20 at this point in my game history, and I’d leveled her completely with another person. This was my first solo character, and she was a lot of fun! However, I eventually decided to go back and finish the grind from 60-70 on my Hunter. Then I found Unemployed. And I fell in love with the people in my guild. And then I played Ferguson. And I fell in love with healing. And then I met a Dwarf Hunter. And… well, that was that. I thought it’d be nice to play on his server with him, and I remembered little Pixxel! She was sitting pretty at level 45 on Ysondre, untouched for over a year. So I transferred her over, and renamed her, because I am too used to being called Brajana now. It was a hectic process, going from being used to playing a class with a shield or a pet-shield, and there was a lot of dying from 45-47 or so while I tried to re-learn how to play and figure out optimal key bindings, but it was worth it! 50-58 has gone so smoothly, I feel like such an agile little mage. Pyro! Fireball! Fireblast! Blast Wave! Loot! Anyway, that’s my quick little story of my new (or not-so-new) mage, Brajana. I’m sure I’ll write about her again as she ventures her way to level 70! Last night, we killed the new temporary boss in Karazhan. Boostah had run Kara earlier in the week, before the boss was installed, and so he had a raid saved with only the new boss left, no trash or anything. Woo! So a bunch of us pilled in, looking to get the new pet and such. Well, of course he dropped the [Arcanite Ripper]… I hadn’t really looked at it before, but I had heard about the sweet Use ability… turns you into Bergrisst of L70ETC. It’s actually a really amazing hunter weapon as well. So Boostah, the ret paly (?) and I rolled on it… Woo! I won! I felt a bit bad, since it was Boostah’s raid and he had organized everything… but come on, I have been switching between [Hellscream's Will] and [Blackened Spear] since shortly after I hit 70, over a year and a half ago. It is time for me to get rid of my last blue quality item! Unfortunately, it does bring me 7 below the hit cap. I will probably have to shove a hit gem somewhere in my gear to make up for it, if I find that 7 hit rating is making a significant difference. I think that’s only like, 0.05%, so if it means I’ll be missing only that much on raid bosses, I can probably live with it. If anyone knows the math better (I’m too lazy to look it up) please correct me! Oh, and the funny thing… back when I was using [Hellscream's Will] all the time, I always joked about how it looked like an electric guitar strapped to my back, and I always wanted to swing it around and play it… well, now I can! So I thought I’d give a bit of an update. To be completely honest, I had a post all written up about what I’ve been doing since 3.0.2 hit, but I keep forgetting to insert the screenshots I want in it, and so it’s been sitting around waiting for the longest time. So here’s the quick version. I plan to elaborate on most of these topics in independent posts, but here’s an overview of what’s goin’ on. I am loving the new pet changes. I can hardly even contain myself about how much I love being a hunter right now! I’ve picked up a Moth, just like I said I would. His name is Ambrose, and he’s purpley and flappy and a darn good Ferocity-tank. I’ve also picked up a Gorilla, who still needs a name. He’s the Unk’loc skin though, and I spent two whole days waiting for him to spawn. But that’s another story for another post! The hunters of Unemployed have picked up Orange MC Core Hounds. They’re pretty nifty, but mine is remaining in the stable until they get rid of the screen shaking. While it’s true that if you are the hunter with the stampy pet, it doesn’t affect the screen nearly as much, I feel for the other players and won’t subject them to that. Okay, Ferguson has nearly retired until the expansion comes out. But I did log on to check out the spellpower changes to his gear, and between my Shadow set and my Healing set, I’ve formed a super set of spell power gear. Just one set of gear. It’s pretty nice. are fun! But I am not nearly as dedicated to them as some people I know (points at Boostah). I haven’t gotten any new titles yet. More on the achievements later. I’ve been spending quite a bit of time leveling a couple of alts. I resurrected my level 45 Gnome Mage and transferred her to my boyfriend’s main server, which is a PvP server. How it remind me why I left that type of server in the first place! But I’ve gotten her to 55 with little problems, and I am enjoying setting things on Fire. Although Fire Mages have very little to do with healing or huntering, I’ll probably write something up about playing a new class. I also spend a very significant portion of yesterday playing a new character. It’s a hunter. There’s a bit of a story behind how I ended up starting a second hunter, and I’ll get into that in another post, I’ll introduce him formally. He’s cute, I think you’ll like him! Unemployed’s Second Annual Hallow’s End Costume Contest! Last night, we took a break from the zombies and everyone dressed up and met in Brill. We had a blast, and some of the costumes were amazingly creative! Way to go, Unemployed! Mine was about as second-hand as you can get, but I still had fun. Screenshots inc, I promise! Well. It looks like I’ve got quite the load of posts to work on. You don’t even want to know how much stuff I’ve had going on IRL lately, to boot. Busy, busy, busy! I love the Horde. Anyone who knows me at all knows this. But why do I love the Horde so much? And not just me, but why is there so much pride for players of this faction? This is the question I’ve asked myself. NOTE: Instead of saying “except the Blood Elves” all the time, I’ll just make a disclaimer that I am not a big fan of them. They don’t count as part of the Horde as far as I’m concerned, in this post at least. First of all, I think the Horde has such strong lore around its leaders. And what is a faction without its leaders? Thrall and Sylvannas especially have great stories behind them, and you can really feel like you have a connection to them if you learn their stories. The Alliance? Not so much. Who have they got? Jaina Proudmore? Okay, she’s pretty cool. But she’s not even truly Alliance – she’s almost neutral. Her and Thrall? Giggity-giggity is all I’ve got to say there. It’s not even just the leaders. The story behind the Horde draws so much more sympathy from me. They’re the underdogs, they’re trying to make their place in this new home and ally themselves with their neighbours. While the Alliance are just kind of there, holding on to the threads of an allegiance formed to fight a force which is no longer there. Another point for the Horde for me is their races. I tend to shy away from human-like characters when I play games. Humans, Dwarves, even Gnomes are just not colourful enough for me. If I wanted to be a human, I’d just, well, I AM a human, so I’d just be. When I play a game, I want to be something different, and not just in height (or ear length) but actually different. Humans are boring. Now, it’s not like I have a whole lot against the Alliance. In fact, I’ve secretly got a level 50 Gnome Mage that I’ve leveled up and been playing quite a bit more lately. But I just don’t feel a connection to the faction itself. 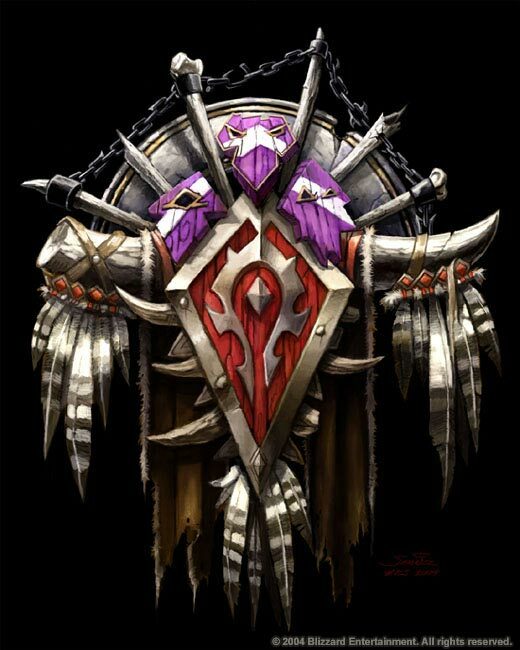 And I don’t see other players displaying the same pride that players of the Horde do. I think the fact that I leveled on a PvP server may have also had an effect on my Horde allegiance. When you’re on a PvE server, and you can quest right along side the Alliance… you might not form the same rivalry as when you can kill and get killed by them. Also, the Alliance has Night Elves. /hate.